Two of Nigeria’s representatives on the continent lock horns in an animated fixture in Nnewi, as the Nigerian Professional Football League enters Match Day 4. There’s also the Abia Derby involving two clubs funded from same source; Abia Warrior (Umuahia) and Enyimba (Aba). In Uyo, it is a dicey tie for Rangers who have a date with the Akwa United, while Sunshine Stars return to Akure to welcome Kadiri Ikhana’s Kano Pillars. Attention will tilt to Gombe as league leaders make a road trip to tackle the Desert Scorpions. This will be Plateau United’s second away game. 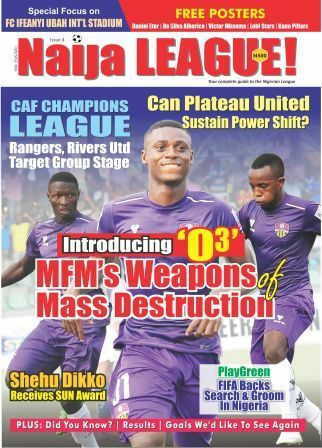 There seems to be clash in almost every part of the federation: Maiduguri will witness El-Kanemi Warriors take on Katsina United and then to the West where Shooting Stars host MFM FC in Ibadan. The South East, of course, will be animated with the Oriental Derby, which is also christened the Abia Derby. Abia Warriors wait on the ‘People’s Elephants’ - Enyimba. This is the second time Eguma will lead Rivers United to Nnewi. The other time, the Pride of Rivers left the FC Ifeanyi Ubah stadium without a point. Apart from the fact that these two clubs will represent Nigeria in continental football, they have been in the forefront of putting a formidable squad and supplementing the team with seasoned NPFL Stars. The homers acquired the services of Prince Aggreh, Ifeanyi Onuigbo, King Osanga, etc. while Rivers United brought in Nzube Anaezemba, Bolaji Sarkin, Emeka Ogbugh and the likes. Yaw Preko set a standard for home fans by thrashing MFM 4-0 in his first home game as gaffer, such feat will not come easy against the Port Harcourt based side who are also a force to contend with in the course of the championship. With this fixture, Rivers United unbeaten streak will face a major test as FC Ifeanyi Ubah remains one the clubs in the NPFL with an unbeaten home record, from last season till date. However, Yaw Preko has an uphill task and he is spoilt for choice, considering the quality of players at his disposal. Wednesday’s contest is between two of NPFL’s brightest sides. Though, FC Ifeanyi Ubah are the favourites here, United come into the fray as a club effectively taking all their chances. Venue: Lafia City Stadium, Lafia.